FREE!!! 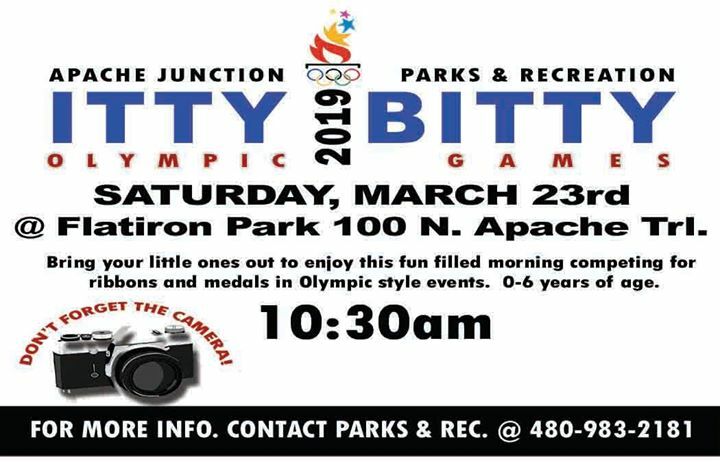 (No Pre-Registration Required) The City of Apache Junction Parks and Recreation Department will host the Itty Bitty Olympics on Saturday, March 23 at Flatiron Community Park. Bring your little ones out to enjoy this fun filled morning competing for ribbons and prizes in Olympic style events. Don’t forget to bring your cameras to catch those unforgettable shots. The events will begin at 10:30 a.m. Check-in will be from 9:45-10:20am. Divisions will be: 0-2yr, 3-4yr, 5-6yr for Boys and for Girls.